Tess Masters, The Blender Girl is back with a simply sensational pasta dish. 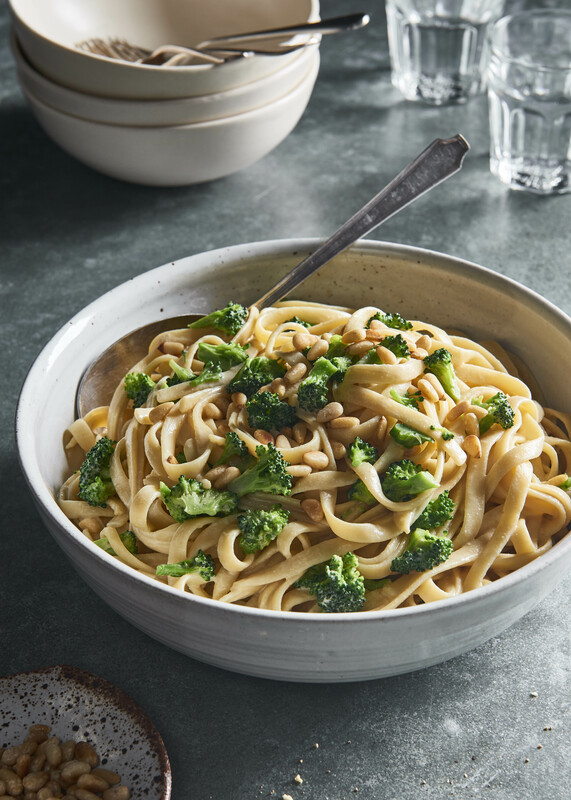 Made with gluten-free or regular fettuccini (or spaghetti if you prefer) the broccoli florets give this dish a vibrant touch of green, and is spiced up with red pepper flakes, Dijon mustard and tangy lemon juice. Cut off the top of each of the heads of garlic, and brush each head with 1 teaspoon of extra-virgin olive oil. Wrap each bulb in parchment paper, then foil (to allow the garlic to steam and not burn, and to reduce aluminum transfer), place on baking sheet, and roast in the oven for 40 to 60 minutes, until tender. Allow the bulbs to cool, and then squeeze the garlic pulp out of the peels, and mash it. (You should have 3 to 4 tablespoons of roasted garlic puree.) Set aside. In a large saucepan, cook the pasta according to the packet instructions. Drain, and set aside. To make the sauce, pour 1 1/2 cups of the broth into the blender with 1/2 cup of the pine nuts, the mashed roasted garlic, nutritional yeast, lemon juice, mustard, onion powder, liquid aminos, seasoning powder, and red pepper flakes, and blast on high for 30 to 60 seconds, until smooth and creamy. In a large pot over medium heat, add the remaining 1/2 cup of broth and the broccoli florets and sauté for 3 to 5 minutes until just al dente and still vibrant green. Reduce the heat to low, and stir in 1/4 cup of the blended sauce, until evenly coated. Add the cooked pasta and the remaining sauce, and toss gently with two wooden spoons until warmed through and evenly coated. Stir through the remaining 1/2 cup of pine nuts, and the chopped parsley. Serve topped with a sprinkle of chopped parsley, and pass additional red pepper flakes at the table.